According to Wikipedia, anthropologists fall into two camps when it comes to the origin of kissing: (1) It is instinctual and intuitive; and (2) it evolved from what is known as “kiss feeding,” a process mothers used to feed their infants by passing chewed food into their babies’ mouths. Another interesting tidbit: Vaughn Bryant, an anthropologist at Texas A&M University who specializes in the history of the kiss, says the earliest known reference to kissing-like behavior originates from the Vedas, a large body of Sanskrit texts from the ancient Indian subcontinent, around 3,500 years ago. In the Sumerian poem, the author wastes no time describing what we call French kissing. But since I am notoriously not one for PDA, doing it or watching it — I cite my Catholic upbringing — I will go no further on this topic other than to transition to the tongue’s most vital task in wine appreciation: taste. As editor of OWP, I’ve sampled thousands of wines in our Cellar Selects program. Dominant flavors such as bright cherry, ripe blackberry, Granny Smith apple, freshly squeezed lime, juicy melon, sweet tobacco, earthy mushroom and well-worn leather always delight. Yet it’s the “kiss” that makes the taste experience a thrilling one. 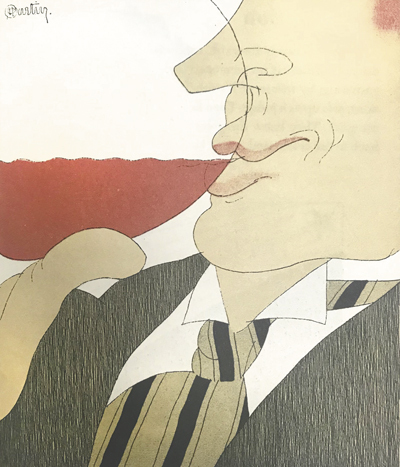 A kiss of thyme in Gamay, a slice of banana in Pinot Gris, a wisp of gun smoke in Pinot Noir or a dusting of clay in Cab Sauv, these little surprises, like a sudden embrace, incite passion for the wine lover, enriching the relationship of drinker and drink. 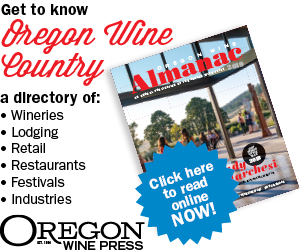 So, as you read about the “Best Places to Kiss in Wine Country,” a lighthearted feature on romantic locales, remember, you don’t need a partner for the love to spark, just a pair of lips and a glass of Oregon wine will do.